Zoom to North Africa. The Night View of City Lights. 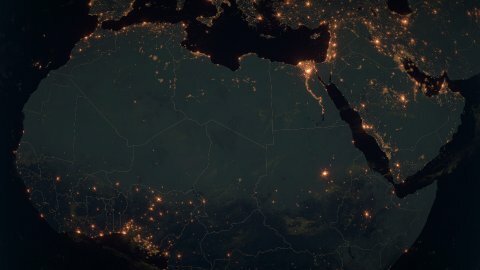 World Zoom Into North Africa - Planet Earth. Political Borders of North African Countries: Egypt, Libya, Tunisia, Algeria, Marocco, Western Sahara, Mauritania, Mali, Niger, Chad, Sudan, Ethiopia, Nigeria, Ghana. The Biggest Cities: Cairo, Alexandria, Khartoum, Tunis, Tripoli, Algiers, Casablanca. Super Detailed Space View Earth Zoom. The High-Resolution Texture. 4k.